Home > News > Early Years > Fun with Forensics! Inquisitive inspectors put on white suits to uncover a crime at Greystone Manor! 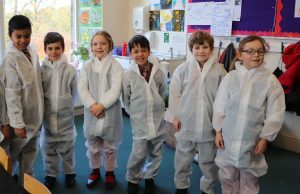 Louise from The Detective Project visited Ghyll Royd School with her forensics workshops last month. Reception and Forms 1 and 2 explored the scene of a crime. 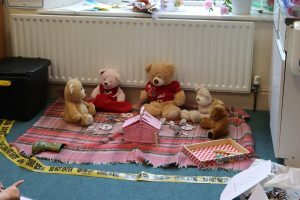 The classes visited the crime scene separately to uncover who had stolen the last sandwich at the teddy bears picnic. The children found fur and welly boot footprints which they had to match up to find the culprit. Form 3 had a murder mystery to solve and collected evidence from a skeleton. A letter, his wallet and sweets with bite marks in them were all collected as evidence. The children thought about how each piece of evidence could be used to find the murderer. All the children took their own fingerprints and made keyrings and bookmarks to take home. They analysed their prints to see what made them different to one another. 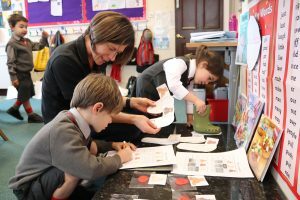 All of the children enjoyed becoming mini detectives for the day and thought logically about how to match the pieces of evidence together. Thank you to Louise for visiting us for a super science lesson!